A watercolour painting completed after spending the day observing the Regatta at Falmouth in Cornwall with hosts Alison and Richard Collins who “were kind enough to sail me up the river Fal”. An Inspirational experience and then an outpouring of work ! “The day gave rise to a number of watercolours and many since then”. 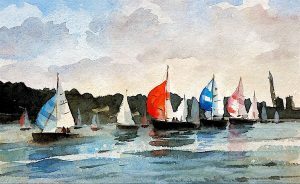 The coloured sails of the competitors boats in the harbour were brought to life by the Cornish light, a truly magical day.This particular painting features in a YouTube video on coastal scenes. If you would like to see more then click the link on his website.